I have reviewed a lot of IK Multimedia products in the past before, and for some reason, I remember them for their microphones, particularly the iRig. In the past, I have reviewed the iRig Mic Sutdio, the iRig Mic Field, and the iRig Acoustic. But enough cross-references, let’s talk about the latest is iRig Mic HD 2. Yes, apparently the iRig is an important brand from IK Multimedia, and they have created a great tool for audio content creation in the form of a mic. It is for the iPhone, iPad, Mc, and PC, and it has high definition audio quality up to 24-bit/96 kHz and a low noise preamp. As you can see, the iRig Mic HD 2 has the handheld form factor of a microphone, and it has all the cables and accessories, even the tripod seen here. I am told that it is “iPhone ready”, which is made Apple certified MFi hardware for iDevices, plugging right into the Lightning port. 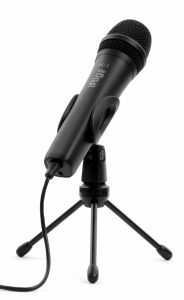 By the way, the iRig Mic HD 2 comes with over $170 of software and apps, and that includes Ableton Live Lite, a Digital Audio Workstation app, T-RackS Classic collection of audio processing plug-ins, as well as Mic Room, virtual models of the most desirable microphones of all time. You can find out more about the iRig Mic HD 2 on the IK Multimedia site, and it costs about $129.99. Get it now for the holiday season, and I hope to review another IK Multimedia product here soon.